This exclusive offerring from Speech Recognition Solutions provides three microphones in one: a computer-mounted mic, a free standing desk-mounted mic, and a comfortable and lightweight hand-held mic. At the core of all three options is the SpeechWare "TravelMike", a ground-breaking product designed for the mobile user wanting to maintain a low profile and portability without sacrificing quality and performance. This set-up packs all the performance of the larger and award-winning TableMikes in a package so small it can fit in your pocket. The current version includes a new "snub-nosed" microphone element which is identical to the element used in the larger TableMike series. The result is indentical performance at a fraction of the size. Without question, it is the ideal choice for notebook, ultrabook and tablet PC user. Comments: We haven't seen a product as innovative and exciting as this one in several years. In fact, only the basic TableMikes (3-in-1, 6-in-1 and 9-in-1) match this product in functionality. It is so small that it can fit in your pocket or a small space within your computer case or portfolio. We find the overall quality, both in terms of build and functionality a solid 10 out of 10. The downsides? It's expensive. Also, although it does a superb job in canceling external noise, we wouldn't recommend using it in a room with loud competing noise unless you are using it in the hand-held manner. For users wanting to fold this down when using a laptop computer, we recommend purchasing the FlexUSB adapter shown below, which gives you the ability to rotate the travelmike in almost any axis. The version of the TravelMike we sell is the second generation version, released in October of 2015, and includes the new "snub-nosed" microphone element, rather than the previous smaller element on a 4-5 inch boom. This newer element is more sensitive, more accurate, and is identical to the element used on the larger TableMikes. We consider the new element a clear and welcomed upgrade to an already great product and one which truly makes the TravelMike a smaller but functionally identical product to the larger TableMike products. 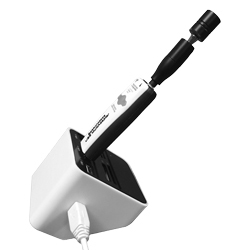 Finally, this combination product is unique in including our exclusive base unit which allows you much more flexibility in where you mount the TravelMike and also a USB extension cable which allows you to use the TravelMike as a hand-held microphone. This combination has become our personal favorite since it works so well, offers many options for use, and is highly portable. When used as a hand-held microphone, this is without question the most accurate hand-held mic we have ever tested! 3/23/2015 – I am interested in using this microphone with the newest MacBook Pro and Dragon Dictate Medical for Mac version 4. Will there . . . Response From Speech Recognition Solutions: No problem and our user guide which is included with your purchase is very helpful with Mac set-up. 12/30/2013 – Is this compatible with Windows 8.1? Response From Speech Recognition Solutions: Yes! All current (January 2014) SpeechWare products are fully Windows 8/8.1 compatible. 12/6/2013 – Is this compatible with Dragon Naturally Speaking Pro? Response From Speech Recognition Solutions: Yes! The TravelMike, SpeechMatic MultiAdapter, and all current TableMikes are fully compatible with all versions of Dragon. The TravelMike and MultiAdapter have had some compatibility inconsistencies with Dragon Dictate on the first generation of Macs with USB3.0, but this appears to be an issue with the Mac drivers - the same devices work fine when running Windows on a Mac via Boot Camp. There does not appear to be any issue with the latest Macs and OS X Mavericks.